The world of David Joyâs rural Appalachia is soaked with blood, soaked with whiskey, soaked with rust, with violence, with family dysfunction, with meth and pot and pills. In his first novel, Where All Light Tends to Go, Joy works with the materials many call the stuff of âcountry noir.â The result calls to mind the work of powerful writers such as Ron Rash, Daniel Woodrell, Mark Powell, and Cormac McCarthy, from whose Blood Meridian Joy takes the novelâs epigraph. McCarthyâs âterrains so wild and barbarousâ are pretty popular territory in contemporary Appalachian writing, and it takes a fine writer to make that territory his own. 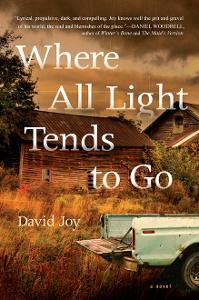 Joyâs novel is set in a sparsely populated county in Western North Carolina. Jacob McNeely is an eighteen-year-old dropout who works for his father, Charles, the countyâs drug baron. Jacobâs responsibilities have been limited to small tasks, but he is entrusted with a mission that involves something at the heart of his fatherâs business success and at the heart of the novel: retribution. His father instructs him to take care of a snitch, with a couple of Charlesâ assistants, the Cabe brothers, for help with the interrogation. The job goes terribly, violently wrong in a chapter that reels with hysteric tension, and the McNeely empire and family are jeopardized. The only hint of clarity in Jacobâs life seems to be Maggie Jennings, the local girl he has grown up with and fallen deeply in love with. Maggie hopes to leave their small town and go to college, and she hopes Jacob can come with her. Jacob is skeptical about his ability to live any life than the one he has inherited from his overwhelming father and his crankhead mother. But he believes he can help Maggie to save herself, and sees there is a possibility she might save him as well. As bleak as the material might sound, in Joyâs masterful hands, it doesnât simply come to life. It sings. How Jacob negotiates the land mines (sometime literal) of his adolescence and how he becomes a man can be dreadful to witness, yet it calls for witness at every step. There are wonderfully empty moments that speak to the everyday existence of a bored teenager in a rural homeplace; these scenes are lyrical but foreboding. Joy has crafted a piece of masterful fiction. His sense of pace, his ability to catch the reader off guard with explosive and often upsetting incidents, his way with the shape of a chapterâall herald a major young writer. There are wonderfully empty moments that speak to the everyday existence of a bored teenager in a rural homeplace; these scenes are lyrical but foreboding. Some are almost soundless. And then, Joy will give the story a turn that ratchets up the adrenaline to a terrifying levelâsometimes instantly, but sometimes in incredibly controlled stages that are just devastating. While the subject matter can be dark, the writing always seems to stay simple. The window knob is as much a part of the landscape as the bodies on the front seat. Joy saves the color for the dialogue of some of the more vibrant characters, usually older men. Jacobâs father is bombastic and theatrical. Joy almost always sets the most dramatic passages inside the McNeely home, and Charlesâ voice fills the rooms, echoing through the scene and through Jacobâs being. Family attorney Irving Queen is brash and bizarre (âUnhand me, you maggot! This suit was tailored custom by Jos. A. Bank. Ever heard of him? Can you spell it?â). Lieutenant Jessup Rogers is softer spoken, a calming presence, but authoritative and at times the novelâs most cogent voice of reason. Rogers is also the character who is most subtly drawn, so while the others are more entertaining, he may be the most appealing character of the book. If there is a weakness in Joyâs novel, it is one that has also been ascribed to Hemingway: the women. There are few here, and at times, they seem little more than shells. Maggie, Charles McNeelyâs girlfriend Josephine, and Jacobâs mother do not have the presence the male characters do, and thatâs a problem, particularly in the person of Maggie. Itâs hard to understand what the attraction is: she is pretty and smart, but is she as pretty and smart as Jacob believes? Is it Joyâs intention that we see Maggie with more jaded eyes than his narrator? While Joy may be working in a recognizable âschoolâ of contemporary fiction, his voice is a fresh and a vital one. The novel establishes him as one of the most promising young writers of the southern mountains. His second novel, Waiting on the End of the World, will be published by Putnam in 2016, and it will be very interesting to watch how he shapes his career. He has certainly braved a barbarous terrain, and he makes a convincing case for claiming it for himself. Tim Dunn teaches composition and Appalachian Studies at Hazard Community and Technical College in Hazard and Jackson, Kentucky. He works with several non-profits in Hazard.